ST. PAUL, Minn. -- The Toronto Maple Leafs selected American forward Tyler Biggs with the 22nd overall pick in the NHL draft on Friday night. The Leafs sent their 30th and 39th overall selections to Anaheim in order to get the Ducks' pick. The six-foot-two, 210-pound Biggs spent last season with the U.S. under-18 national team development program. He had 28 points (17 goals, 11 assists) in 48 games. His father, Don Biggs, was drafted in 1983 by Minnesota (156th overall) and played 11 games for Philadelphia in 1987. 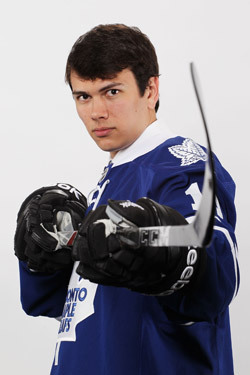 The Leafs selected Mississauga-St. Michael's Majors defenceman Stuart Percy with the No. 25 pick. The Oakville, Ont., native was named to the all-star team at the 2011 Memorial Cup. The Majors lost to the Saint John Sea Dogs in the final. The six-foot 186-pound blue-liner had 33 points (4-29) in 64 games last season. ``I wouldn't expect our fans to see either of these players right away. They certainly need more time,'' Burke said. ``In Stuart's case, this is a guy whose stock went up steadily throughout the year. He had a great finish to the season, a great Memorial Cup. Burke, who earlier in the day acquired defenceman John-Michael Liles from Colorado for a second-round pick, said there may be more dealing on the second day of the draft.